Clotted cream tastes wonderful on just about everything, and particularly on pumpkin pie. ‘Tis the season after all, but so much for rapid weight loss. Anyway, that made two trips to town and two trips back for my exciting day. Bill also made a trip to town and a trip back. Town is about 15 minutes away. Could that be over an hour driving to and fro? Did I want to cook dinner? No. And Bill, being the darling husband he is (we are sort of sarcastically gushy you know), suggested we eat out. Another trip to town? No. We decided to dine at THE PINK CADILLAC. Hence the photos. My blogging friend, Cindy, from the wilds of Canada, noted for her Photos from the Loony Bin, actually met Bill and me at the Pink Cadillac not so long ago. She was with her QT husband Mikey. They are an adorable couple and we wish they would come back soon. If Cindy and Mikey stay awhile at the Pink Cadillac they may notice all the pics of old film stars on the walls. It is almost embarrassing that Bill and I can name all of them. James Dean, John Wayne, or Elvis Presley, Vivien Leigh, Jimmy Stewart, Roy Rogers, Gene Autry – they are all there. 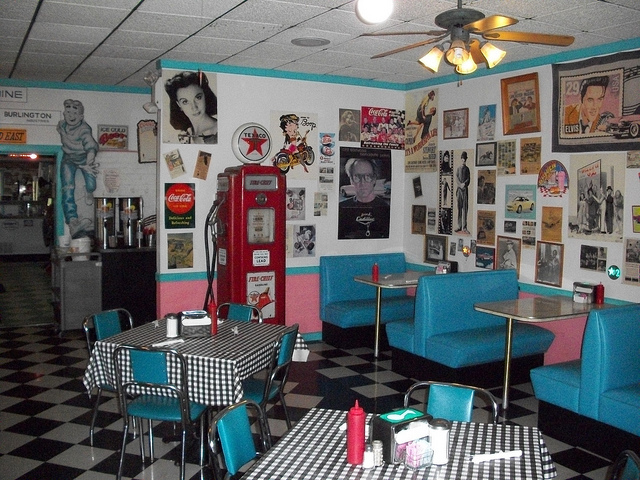 If you find yourself in my neck-o-the-woods, plan a stop that will take you back in time to a 1950’s diner called The Pink Cadillac where looking at the walls is a joyful way to wait for your Elvis burger and fries! And be sure to let me know when you’re coming huh? I’ll meet you at The Pink Cadillac! Okay, I am on a diet too. Let’s go have some malts here tomorrow. Do you think they would sell the caddy…Xmas 4 Jim! 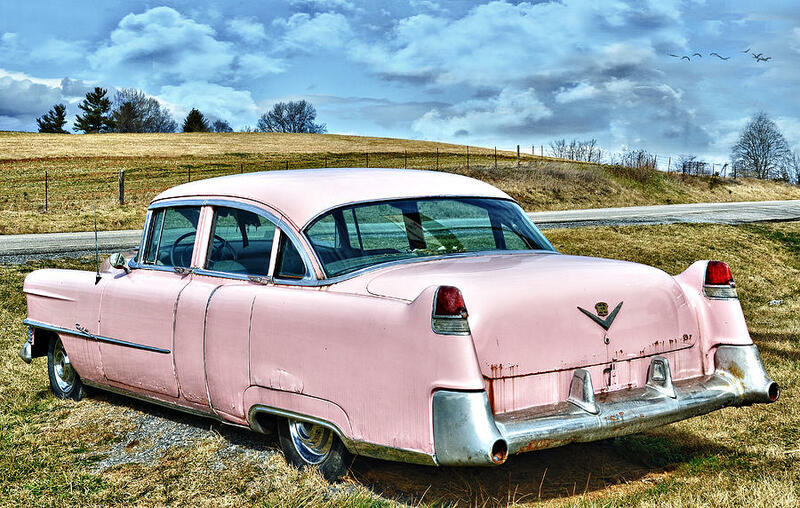 The Pink Cadillac is God saying maybe you are sweating the small stuff. There are some things on the menu that merit praise Eliza. A malted might qualify. 🙂 And have you ever had fried cauliflower? Yum. My sister used to love eating at a restaurant near Minneapolis called Classic Car and it was very similar in appearance to your lovely little restaurant! It’s nice to have places with good food and eclectic décor too! They don’t build cars like that any more! Looks like a fun place to eat. 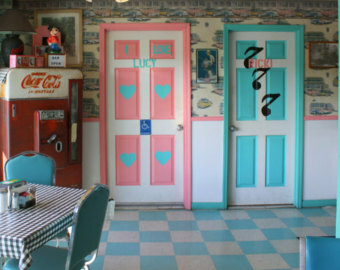 I love places like the Pink Cadillac…such fun! Thanks for sharing your trip, Dor. I didn’t know how to make clotted cream which I was served in Scotland with delicious scones and jam. Do you add sugar? Now onto jeans: have you tried Jag jeans, Dor? I really like that brand. But we all have such different body types that what works for me may not for you. Jeans are almost as bad as bathing suits for a depressing shopping experience! And big yes to fried cauliflower. QT husband – Bahahaha!! I love it! 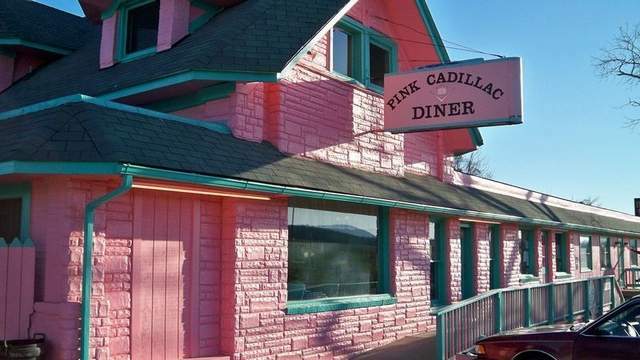 Oh Dor, how we miss you and the Pink Cadillac and wish we could come back right now. I still have tons of pictures from that wonderful visit, including some from the Pink Cadillac, that I haven’t even posted yet. I must get on that! I was thinking it would be really fun to do a post comparing Foamhenge to the real Stonehenge which we saw this summer :). As for the jeans, you’re not the only one. I keep trying to diet, and then Mikey cooks some huge fabulously fattening meal, and I fall off the wagon once again. I give up on buying new clothes :). Clotted cream recipe? You have the most diversified blog. BTW your celery tip works. Having lived in NJ for a while, I just love diners. They make the best breakfasts ever! Just might come down but in nicer weather! Try Not your Daughter’s Jeans. I never bought them but the advertising says you wear a size smaller than you normally wear. It may be just the boost you need. Wouldn’t it be fun to get together when you come for a visit? Another reason to wish for spring! It’s what keeps us happy! When you come for another visit, Mikey will have to cook us a huge fabulously fattening meal! I might go off the wagon anticipating that. 🙂 And the heck with new clothes. You are right Patti… it’s a fun place to eat. If you’re around with kids, it’s even more fun. They love it. Bill and I were upset when they painted the place that bilious pink. It interfered with the rural beauty of the area. Over the years, we have come to accept it as a fun place to take visitors, especially children, and it is very close to VASafari Park and the Natural Bridge. He would definitely do that! He has already made three pans of lasagne that are in the freezer and he is working on cabbage rolls today. Then when we go to see my parents after Christmas, there will be two meals my mommy won’t have to cook :). That’s why I keep him around LOL! Dor … Now you have me singing Natalie Cole’s version of “Pink Cadillac.” Great fun! You no doubt got more of a workout than Bill trying on 6 pairs of pants … I’m sweating just thinking about that experience. I’m in love with the Pink Cadillac! Perfect place for your two movie stars to grab a bite. This is a hard season to be a vegan. Oy, will I kind of make it? I am lucky to have him because I hate cooking too. I love the eating part though :). Oh gosh, I’d LOVE to meet you at the Pink Cadillac! What a darling place. (I can be gushy too when I want to be!) 😉 And after we eat our Elvis burger and fries (forget that diet, girl! ), I’m going back to your house for clotted cream on scones (I’ll bring them) and tea.